Cucumber pickles make a great side dish to all sorts of cured fish, sandwiches and cold meats to name but a few. They are really easy to make and will keep for upwards of a month in the fridge. Great as part of a picnic or barbecue in the summer, homemade pickles are much tastier than the shop-bought variety, and as you get to control the sugar content they are better for the health conscious among us. 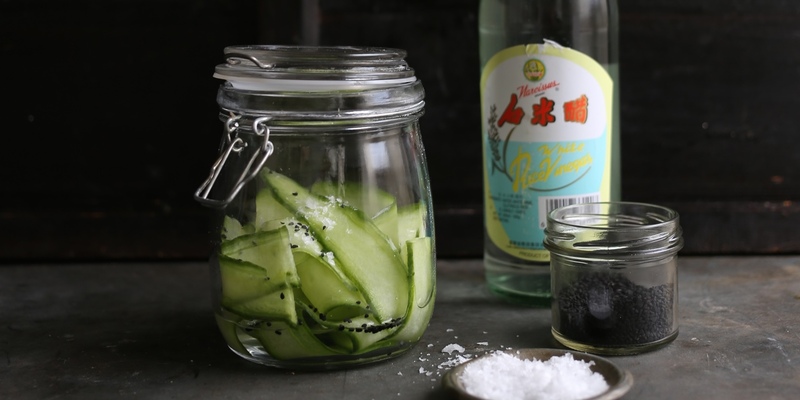 Try adding other flavours to the pickling liquor, such as traditional herbs and spices. You could also try adding chilli or ginger for a warming kick – mustard, coriander and celery seeds also work well. Robert Thompson adds juniper and bay leaves to his pickled cucumber, alongside a ceviche of Cornish mackerel with a light horseradish cream, while Georgina Fuggle slices her cucumber into ribbons to accompany her sesame salmon and sticky coconut rice. For something a little different, try Sean Rankin’s canapé, where he mixes pickled cucumber through homemade taramasalata.